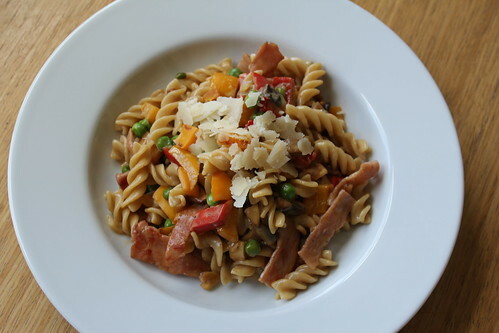 I got this offa the Taste of Slimming World app and adapted it. I had to adapt it, because it had tomatoes in it and my Mum and I think, quite rightly, that tomatoes are the Devil’s food. Anyway. This is really, really quick. 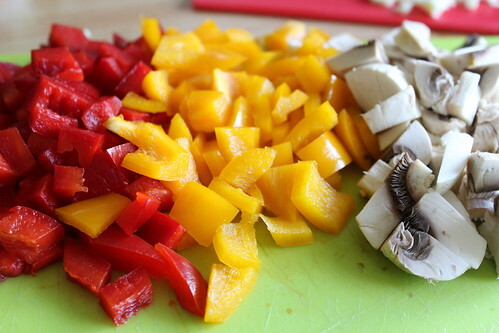 Between 15-30 minutes, depending on how quick your chopping skills are. It serves four and it scrummy. My Dad detests pasta in all forms, but even he liked this. I’ll write this up as I make it, but you can find the actual recipe on the app — it’s free to download. Boil the pasta in the way that the cooking instructions say. 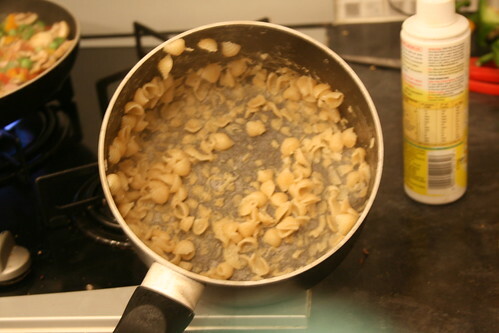 The way I do it is just put the pasta in a saucepan, cover with water, put the lid on and heat. Simple. Then prepare your ingredients. It’s best to do this before you cook anything because everything happens very quickly once it gets going. Trim the bacon of all fat and cut it into strips. Deseed the peppers before chopping them and the mushrooms into chunks. Then separate the eggs and have them ready. 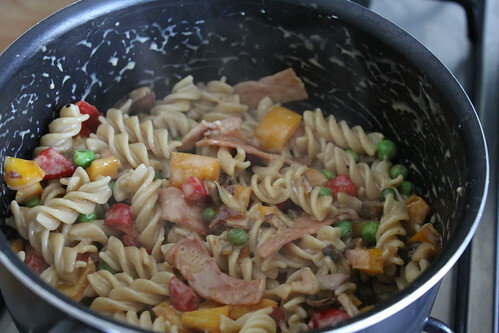 When the pasta has about about 10-12 minutes left, spray a large frying pan with Fry-Light and add the bacon to the pan. Cook it for about 4 minutes, until the bacon has gone a darker pink. Then add some garlic, the mushrooms and the peppers. 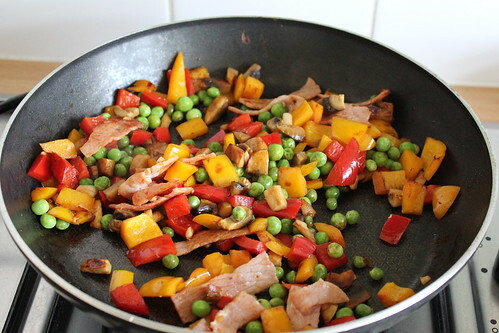 Fry together for another 3 minutes before adding the peas. Never mind. In a small bowl, use a fork to beat together the quark and the egg yolks. Add some pepper and beat again. It should end up being quite creamy. 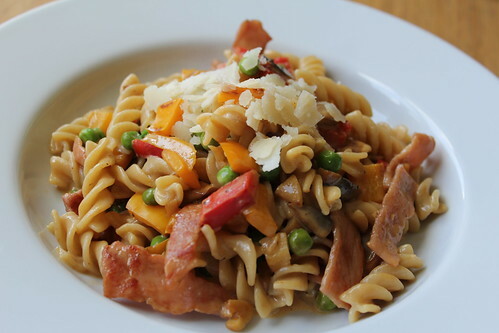 Considering how little effort goes into this, it looks and tastes so good. I popped some parmesan on top too, because parmesan is lovely. There’s a few more photos here if you want to see them. As long as you prepare everything before you cook it, though, you shouldn’t have a problem with this one.